In the last few years, I’ve discovered wheat berries. What took me so long? They are one of the new “ancient” products to hit our shelves. They are delicious in salads, giving a nutty flavor and a chewy texture. They have names as simply wheat berries, farro (from Italy), kamut (from Egypt), freekeh (from Arabia) or spelt (from Germany). Each culture has its differences, depending on the land, climate and variety of the wheat berry. So why not switch up the grains in your diet and add an ancient grain like kamut? It’s not just healthy, it’s delicious! We used this grain to make a side dish at one of our cooking classes. It’s pretty enough for company (it’s twice the size of modern-day wheat) and it’s not the same, boring rice side dish you may have made zillions of times. Another plus is that it holds up well when made a day in advance, saving you more time when planning a party. 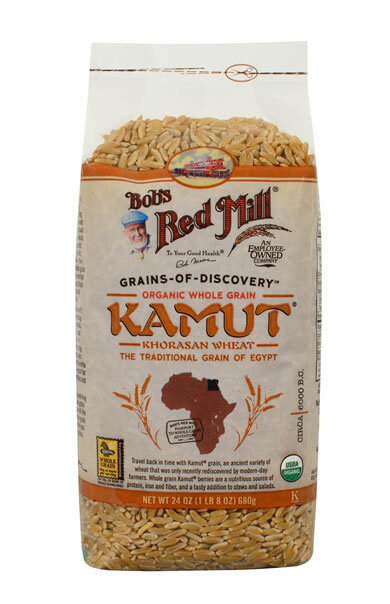 Kamut is one of the whole wheat grains in Bob’s Red Mill’s offerings. It looks like brown rice, but it doesn’t stick together when it’s cooked the way rice does. The Whole Grains Council can give you all the details on the nutrition facts, but consider this. Fiber is the magic word in good nutrition and kamut has 1.8 grams of fiber in 16 grams compared to brown rice at a measly .6. That’s triple the fiber. Other number crunching points to kamut with 11.1% fiber and brown rice at 3.5%. It’s also filled with protein and iron. Wow! You’ve got to give this a try. Kamut has a wonderful nutty brown rice flavor. It will satiate your palate and not leave you hungry. Add some vegetables to it and you will have an interesting, tasty, and healthful new side dish. Or if you are trying to eat less pasta, replace it with kamut in your favorite recipes. Just cook up the kamut and add your favorite pasta topping to it. Yummy! Serve it with some fish and you will have an elegant meal like we did at our cooking class. Get the recipe for Salmon with Pesto and Fig Balsamic Drizzle and start enjoying kamut right away. Don’t wait like I did. Kamut berries sound exotic. Get this organic whole wheat grain from Bob's Red Mill. The package says they are "the traditional grain of Egypt". The taste is like a nutty brown rice. Absolutely delicious with some vegetables added. For best results, soak your kamut in water overnight, then drain. This will reduce cooking time by about 20 minutes. If you have the time, soak the kamut berries overnight and drain. Preheat oven to 375°F. Add the kamut to a pot with 4 1/2 cups water, 1/2 teaspoon kosher salt and bring to a boil. Cover, reduce heat to low and simmer for 60 minutes or 40 minutes if presoaked. Make sure water in pot does not run dry. Test the kamut. It will be done when tender but al dente. Remove from heat and drain off any excess liquid. This process can be done in advance and reheated later. While kamut is cooking, roast the lemon. Slice lemon crosswise into thin slices. Remove and discard any seeds. Place lemon slices in a bowl and toss with salt and pepper + 2 Tablespoons olive oil. Lay the lemon slices on a parchment lined baking sheet in a single layer. Roast in a 375°F oven for 18 to 24 minutes, removing slices as they are golden in color. Watch carefully that lemon slices don't burn. On a separate baking sheet, toss asparagus spears with 1 Tablespoon olive oil, salt and pepper. Spread them out in a single layer. Roast in same oven for about 5 minutes just before serving. Remove from oven and cut into 1 1/2" pieces. Cut leek lengthwise, wash out any sand, then cut white and light green part crosswise into thin slices. In kamut pot, heat 2 Tablespoons olive oil, add leek slices and cook until wilted. Add kamut back into pot along with the cooked asparagus, defrosted peas and give it a stir. Serve, garnishing with the roasted lemon slices. Another option is to chop lemon slices and mix in. We made this recipe in our Spring Entertaining Cooking Class when asparagus was fresh at the farmers markets. Feel free to change it up with whatever is season – carrots, squash and broccoli would be delicious choices too. 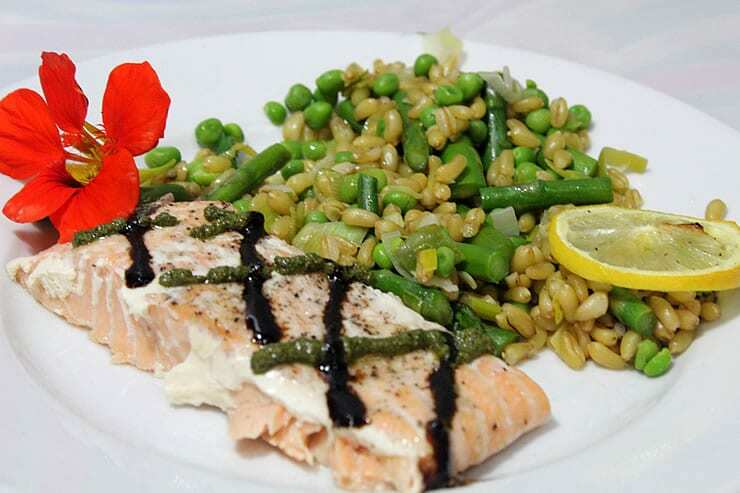 I love the fresh green flavor of the asparagus and peas in Patricia’s dish. It’s similar to dishes I make in the Spring when we see our fresh local asparagus, English shell peas and Fava beans. My preference is to eat what’s in season as best as possible, so at this time of year in place of the asparagus I’d likely use arugula instead. If you don’t care for the peppery zing of arugula though, there are still a few green beans on the vines. However if you do, to add a little twist and tie-in to the plate I also might change up the pesto a bit by using a blend of basil and arugula. Enjoy! I agree Marlen. I like to eat what’s in season. Choose whichever vegetables you enjoy and are available at your local farmers markets or your favorite supermarket. 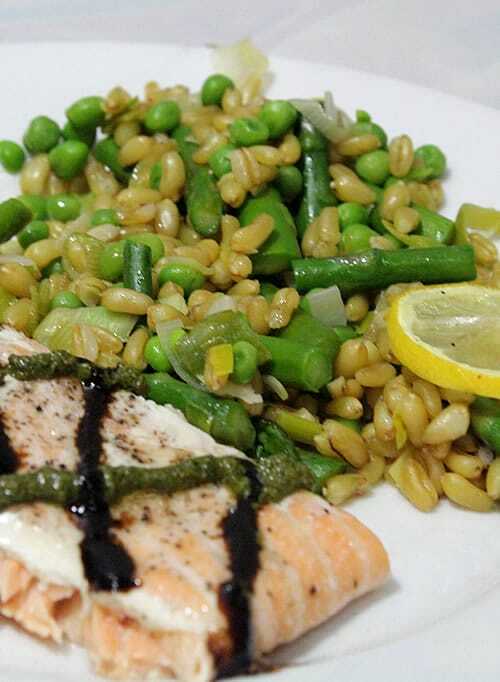 Kamut and other wheat berries are versatile and go with a variety of vegetables. Make it with autumn vegetables today and spring vegetables in six months, but keep it unprocessed and fresh when you can!